Located three kilometers southeast from the current city of Djenne. The large mound called Djenne-Jeno or Djoboro is considered by oral tradition as the original site of Djenne-Jeno. 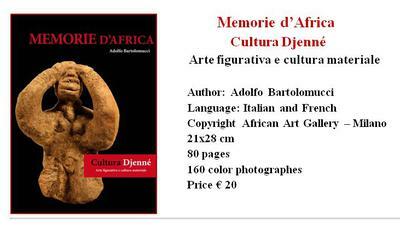 Djenne-Jeno was unknown to history and its significance for centuries. The archaeological excavations of Djenne-Jeno by the MacIntosh couple have revealed that the occupation of the site dates back to the third century BC. Between the fifth and ninth centuries AD, Djenne is composed of a main center surrounded by walls, and already had several thousand of inhabitants. The sites of the inland delta revealed terracotta statuettes including some of considerable aesthetic quality. The excavations have also revealed that the dead were buried inside the city in jars. This mode of burial, widespread in the inland delta, probably persisted until the seventeenth century, well after the penetration of Islam. At the end of the twelfth century AD, Djenne-Jeno began a period of 200 years characterized by a gradual decline and abandonment. Finally, in 1400 AD, it became a ghost town declining in favor of the current Djenne, maybe linked to the rise of the new Islamic religion. The present city of Djenne is also famous for its mosque and its architecture, classified World Heritage by UNESCO. An important culture that developed in Mali between the twelfth and sixteenth centuries AD that is mistakenly called Bankonì, the name of a peripheral rural area of the capital Bamako, formerly a desert area and now a village incorporated in the capital. The name Bankoni was given based solely on the study of two or three objects (including this statue in the museum in Bamako) discovered by the French archeologist Szumowski at the Bankonì site in 1958. Few or no official archaeological searches were later carried out, while a large number of objects have been unearthed during unofficial excavations. On the other hand, the geographical area in which the terracotta artifacts of this culture they were unearthed is very vast. Among the main areas concerned there are the region of Dioila , the region of Ségou, the region of Kutiala, the region of Bougouni, the region of Kolomdieba, the region of Kadiolo , and that of Massigui, all areas inhabited by the Bambara population. 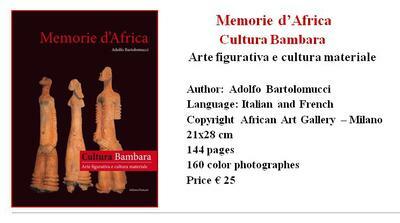 In my opinion it would therefore be more accurate to attribute this culture the name of Bambara culture, establishing then further distinctions depending on the region of origin and types, such as: Ségou or Dioila style Bambara culture, taking into account each time the specific region of origin. The materials collected in this exhibition, made largely by the Soninke people, come from a wide region of Mali, that of the Inland Delta of the Niger River. A sub-tropical region that records specific climatic and environmental conditions, which have led to the rise and mysterious fall of three empires, and then the succession of different peoples and cultures. Empire of Ghana Wagadou the decline of which practically took place in the eleventh century. The Mali Empire, 13th century founder Soundiuta. 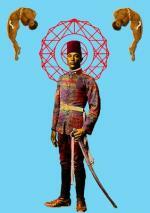 The Songhai empire 15th century founder Sani Ali Ber. These populations, following the floodings and the likely number of withdrawals of water, have built their villages by shaping river clay by hand, which they sometimes abandoned for mysterious reasons. The rainy seasons, which follow each year, wash away the mounds and uncover at random what history has buried and arranged in overlapping layers. In the interior Delta of the Niger life is governed by the influence exerted by the rising and falling movements of flood waters creating an environmental situation that strongly characterizes this region of Mali, in fact , the flooding of an area this vast, assuming the role heat moderator, contributes to changing the climate and justify its important role in the history of West Africa. The potters who produced these bed feet often belong to the artisan classes (transmitted in patrilineal filiation) that possess a certain autonomy with respect to the noble oriented towards agriculture. The clay bed feet were called Sagouantaona in the Bozo language. The site of the necropolis of Bura-Asinda-Sikka was discovered by chance in 1975 in the north-west of Niamey, Niger's capital. A young man of the village, while hunting, finds two terracotta statuettes on the ground that leads into the village which he then abandons inside the house. In 1978, the two heads end up in the hands of his brother, a driver with the IRSH, who understands the importance of the discovery and takes them to the department of art and archeology of the capital. In 1978 an initial reconnaissance is made at the site of the discovery that did not reveal any significant findings. In 1980, due to the heavy rains, heavy erosions uncovered a quantity of archaeological material, hence the decision of the Department to define a site for deeper excavation. In January 1983 the first excavations began, planned for a period of 20 days, in reality they will continue until the end of May. The site under consideration included three types of settlements, one necropolis, one reserved for rituals and one reserved for dwellings. The excavated area was equivalent to an area of about 25 meters long and 5 meters wide: the anthropomorphic urns in terracotta, originally laid on the ground upside down, contained human bones, but above all entire skulls, and the sand and earth thickened in urn thereafter due to infiltrations into the openings that remained. These urns were topped with heads or anthropomorphic statuettes or hairstyles of human heads without faces. A considerable number of stele were found in terracotta and stone and everyday pottery. The terracotta stele, that vary between 30 cm. and 110 cm. in size, are phallic conical in shape with the outer surfaces decorated in relief. The dates on some findings indicate a production period that goes from the third century to the XI century A.D. The texts represents an interesting and original piece of research (on the field and not on texts already written) dealing with a fascinating theme around which it is difficult to find on-site information. 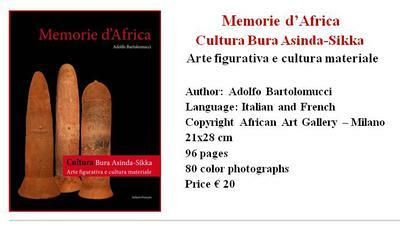 The book proves to be a valuable tool for collectors and researchers, given the accuracy of the information about the points of origin of each object illustrated and presented in a collection that can be visited and studied. Witness the artistic genius of the peoples of West Africa that have produced various types of pottery, the work introduces us to a wide selection of items. 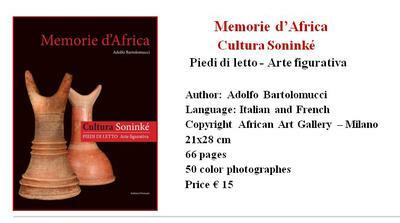 A part of the works presented in this book belongs to the African Art Gallery in Milan and is available for sale to collectors, foundations, galleries and museums.